Have you been thinking of installing custom wood doors Houston TX? These doors are a great way to add a unique touch to any part of your home. Wood doors are durable and insulate well. They are perfect for families of any size. You can also find wood doors in a variety of stains and colors. Customizing them by adding decorative touches can make them the perfect addition to your home. These types of doors are not as expensive as many consumers think. This makes them a surprising way to add character to your home. You may want to consider buying multiple custom doors in Houston, TX. There are many places in your home that would enjoy the special touch a custom door can bring. This is particularly true if your home has odd-shaped door frames. Matching the style of a new door to an older home can also be challenging. In situations like these, ordering a custom door is the perfect solution. Ordering multiple doors at once will ensure each matches the other in style and design. Customers in Canada and across the U.S. can call Southern Front for their custom wood doors. Southern Front sells Houston-based exterior doors as well as interior ones. You can view their available selection online at http://www.southernfront.com. Southern Front is also happy to offer custom models. Contact Southern Front by calling 281-890-5860 to learn more about their custom products. Southern Front is also happy to provide a warranty on their doors. You know you will come home with a product that will last if you shop at Southern Front. One way to give your home a face lift is to upgrade to custom interior doors in Houston. It is important to pick a style you like, and one that works with the room. For example, an oak door would look out of place in a room filled with mahogany. Pay more attention to the durability of the door that its price. You want your renovations to last as long as possible. Buying a high quality, durable wood door is the best way to do this. It is also important to buy a door that you love. Homeowners can choose from many style options. Interior doors with glass inserts are very popular choices. Doors that contain iron elements are also common. As you browse through existing doors, make a note of features you love. This will make it much easier to discuss custom options with your retailer. Southern Front is proud to offer a wide variety of interior doors. They have doors made from many materials, including wood and fiberglass. You can browse their available selection online by visiting http://www.southernfront.com. Consumers interested in custom options can contact Southern Front by calling 281-890-5860. If you want to add curb appeal to your home, invest in new Houston-based exterior doors. In fact, adding a new front door is a great way make your home stand out. Wood doors are perfect for many entryways. They come in many different stains and colors. You can also add any number of decorative touches to make each wood door truly unique. Wood is inexpensive and durable. Thicker types, like mahogany and knotty alder, are excellent insulators. If you are selling your home, try to find an exterior door that is unique yet universal. You want to be sure that you attract as many buyers as possible. Entryway doors that have glass or iron inserts often add a lot of visual appeal to a home. Upgrading to this style of door is a great way to invest in your home’s value. Visit Southern Front to see a large selection of exterior doors. 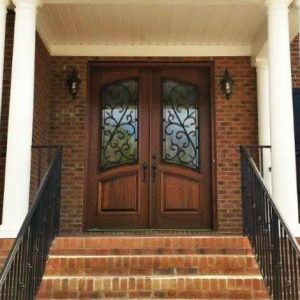 Southern Front is happy to sell entryway doors made from high quality materials. They offer a warranty on their products, giving you extra peace of mind. Prospective customers can take a look at their current selection online at http://www.southernfront.com. You can also discuss custom options with sales staff. Contact Southern Front by phone at 281-890-5860 to learn more today. Custom French doors in Houston will add a lot of sophistication to your home. They are the perfect way to divide any large room. Many homeowners install this style of door between living and dining areas. They are also perfect for separating a front hallway area from the rest of the house. Opting to customize your French doors can result in a beautiful look. Customization makes it even easier to match your doors to the rest of your home. French doors are also often used as exterior doors. Homes with balconies or patios in particular enjoy the elegant look of French doors. Customizing your doors gives you the freedom to choose how much privacy you sacrifice for looks. Some people prefer opaque glass or panes with ornate designs. Consider your preferences as well as the intended location. Keeping these things in mind will help you find the perfect door for your space. Southern Front has a large selection of French doors available. You can take a look at their stock online at http://www.southernfront.com. If you cannot find the perfect set of French doors, speak with Southern Front about custom models. They are happy to create the perfect doors for your home. Interested customers can contact Southern Front by calling 281-890-5860. Be sure you focus more on the retailer than the bottom line when shopping for custom doors in Houston, TX. A high quality, well-made door is well worth your investment. These types of doors will insulate better and hold up against the elements better than cheap products. They will also need less maintenance and cause you much less hassle. Southern Front has many years of experience providing customers with high quality doors. You can take a look at their current selection by visiting them in store or online at http://www.southernfront.com. Southern Front is happy to discuss custom options with customers. You can contact them by calling 281-890-5860. They want to be sure that you wind up with the doors of your dreams. Southern Front is the perfect place to go for custom wood doors Houston TX.